Step up to global services. What is necessary to pep up the present condition of Japan? Problems like falling birth rate, increasing aging of population, uncertainty over national pension scheme and medical benefits, unemployment of new graduates, income difference between Tokyo and local regions will suffice even on a short overview. Among others, the invigoration of local regions in order to create new jobs seems to be very important. Percentage of export oriented industries is rather high in Japan. In order to sell products and services to foreign countries, it is important to create a ring of employment also in the overseas markets. 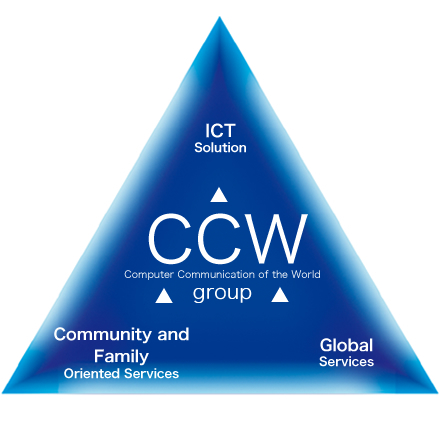 Based on more than 30 years of experience and know-hows on ICT solutions, the CCW group is considering doing its part to rejuvenate the present state of Japan as well as the world through expansion to varied business ventures. The heart of this endeavor will be the “Smart City” project. By putting the internet, mobile phone or smartphone networks to more practical use, a better regional society can be created. The “Smart City” concept is playing a major role among the “New Development Initiatives” implemented by the Japanese government. A city can transform itself to a “city in which everyone wants to live” by putting emphasis on environment and supporting aging population. Such a city is bound to create various types of business chances around it. A futuristic ecological city is not intended to be a mere better place to live, but is also expected to act a vibrant city that produces new values. Energy issues have become a major factor among both the developed and developing nations. The “Smart Grid” concept, which is basically an ICT controlled power transmission network, is gaining world-wide attention as a solution. The realization of “Smart Grid” requires the service of high quality contact centers. The CCW group intends to contribute to the solution of energy problem by providing high quality global service by the construction and operation of cloud-based “Smart Grid” contact centers. CCW group boasts of a deep and broad technical prowess to handle any challenge from managing PCs to infrastructural systems. In particular, our ICT technical support through various contact centers, cloud outsourcing services and high quality overture of KPO (consulting service) are well reputed. This era of cloud computing has made cost-effective services possible through hubs or bases all over the world. CCW group has materialized it through its overseas branch “Shinpida” in Jiangsu, China. In this branch, we have implemented trilingual support in Japanese, Chinese and English to handle global market demand. Needless to say, it has created local jobs. In the near future, we intend to expand to India, Vietnam etc. We are planning to create life assistance services like “residents’ health consultation”, “direct delivery from local farms”, “aid for housework and childcare” etc. “Smart City Solution”, provided through ITC will act as the infrastructure of these services. This is a project to create jobs and rejuvenate local regions. Moreover, this business is also aimed at handling low birth rates and the aging population through childcare and health management services. Copyright © 2011 CCW co.,ltd. All rights reserved.